EDITOR’S NOTE: This week I welcome a new voice to Longbox Graveyard with guest blogger Dean Compton, who offers his personal experiences with one of the foundational heroes in comics. Take it away, Dean! Welcome to my guest blog entry here at Longbox Graveyard! I’m Dean Compton, and Paul has been gracious enough to allow me to fill an egregious omission from The Longbox. Paul has done a rather splendid job of showing us the exploits of the Captain Marvel brought to us by the House of Ideas, but so far, there has been nary a mention of the Big Red Cheese, the World’s Mightiest Mortal, the ORIGINAL Captain Marvel! Of course, it isn’t as though Paul is some kind of evil troll just dedicated to depriving you canny readers of the chances to learn more of the Bronze Age exploits of Captain Marvel so much as it seems that he just wasn’t a fan. While I find that to be the sort of superhero fan crime that should be punishable by repeated readings of Sleepwalker and NFL Superpro, Paul has instead given me the opportunity to correct this tiny slight on what is otherwise a tremendous blog. Lest I get too carried away here, it’s an honor to try and convey just what the Billy Batson/Captain Marvel character means to me. I have loved superheroes my entire life, and I think part of that is the safety of the heroes. I loved how they used their massive power to help those who were helpless, and while that meant lots of fun for me, it also hit very close to home because I was an abused child who was looking for a safe place like the worlds these superheroes strived to create. I also wanted to believe that those who had power did not always abuse it, and superheroes showed that to me. Of course, that makes Captain Marvel very near and dear to me, because, as I am sure those reading a comic book blog would be aware, Captain Marvel is a kid who says a magic word to become the World’s Mightiest Mortal! If you are looking at this comic book blog and you weren’t aware, wow! How did you get here? Seriously, I’d love to know! Take a look here and see a quick origin of Captain Marvel from SHAZAM #1 (1973). So obviously, once I learned of Captain Marvel, it held a special place in my heart. I wanted to say my own magic word and be able to overcome the evil in life. In times when I just felt like giving up, Billy Batson and Captain Marvel helped inspire me to keep going, and I guess I made it out. I have a steady job in television, great friends, and a girlfriend who somehow manages to tolerate stuff like my constant need to launch into long soliloquies about Billy Batson and other EARTH-SHATTERING comic book stuff. I am not going to go into great detail about my situation growing up, but I will say that lots of folks don’t come out as unscathed as I did, and part of the reason is the hope brought by Captain Marvel into my life. I think the first time I ever saw Captain Marvel was in the early 80’s. I’m a 70’s baby by 3 months, so many things at Longbox Graveyard happened before I was born, but anything in the late Bronze Age I recall. One of my gifts in life has been to have a tremendous memory, and so I can recall seeing SHAZAM! Slurpee cups at a young age. I also recall a Captain Marvel cartoon on Saturday Mornings paired with Hero High. I didn’t learn about Captain Marvel though (and thought his name was SHAZAM!) until I was in 6th grade. I started collecting the DC and Marvel cards of the early 90’s, and I was captured by the idea instantly. So, now that we have gotten all that gobbledygook out of the way, perhaps you’d like to actually read about some comics. Hell, even the people who love human interest stories at this point are probably taking to the streets with picket signs reading “GET TO THE COMICS!”, so without further adieu, I’d like to share with you guys SHAZAM #1 and #2 from 1973!!!! To put things in perspective, there hadn’t been a Captain Marvel comic featuring the Billy Batson Cap in about 20 years at this point. DC Comics sued Fawcett Comics, the original publishers of Captain Marvel, over the fact that that they felt Captain Marvel infringed upon the copyright of Superman. The courts originally said that DC had let Superman’s copyright lapse, but an upper court then decided it wasn’t true and said the case had to be looked at again. At that point, Fawcett just settled out of court and stopped publishing Captain Marvel or any other comics. 1954 is the last year they published. (This had as much to do with declining sales after the war as anything else.) They licensed the Marvel Family to DC in the early 70’s and they eventually finished selling their properties to DC in 1991. Of course, thanks to the interim, if you are like Paul, you have been bamboozled into thinking that Mar-Vell is THE Captain Marvel at this point, when from the ashes of legality DC comics licensed Captain Marvel and his family, and gave us this! So twenty years after the courts decided that Captain Marvel infringed upon Superman’s copyright and Fawcett quit publishing the adventures of the Big Red Cheese, DC licensed the rights to the Marvel Family and brought them back in the above SHAZAM! #1. If you ask me, they really got off on the wrong foot right away. Putting Superman on the cover in this way (he does not appear in the comic book at all) just sort of cheapens the event! Instead of safely entrenching Cap in his own world in his own adventures, instead we get the instant Superman/Captain Marvel comparison. Not only is it a comparison we do not need to make, but the way Superman is drawn makes it seem like he is either taking credit for the book or that he is deigning to let it happen. Perhaps the pose is done on purpose as one final “WE WON” from DC, but who knows? That probably wasn’t the reason for it. I do like the “BOOM!” sound effect. The creative team for this book is Denny O’Neil writing and art by CC Beck, and while CC Beck is THE Captain Marvel artist, O’Neil’s stories in SHAZAM! just are not very enjoyable. They just feel forced and, at the risk of offending the God of puns, cheesy. Even for 1973, they feel decidedly whitebread and almost insultingly inoffensive due to their simplicity. I figure either DC wanted these stories to be this way (much is made of the Marvels coming out of Suspended Animation); they are so far removed from what Denny O’Neil is good at as a writer (his “realistic” takes on Batman, or Green Lantern/Green Arrow, for instance); or a combination of the two. One thing is for sure though, after the origin story, CC’s art is about the only reason to keep reading the first issue. Yep, Dr. Sivana was behind the disappearance of Captain Marvel teased earlier in the origin panels, which to be fair, are done well. It’s when O’Neil does Sivana and his family as the most idiotic mad geniuses you will ever see or even the entire idea that Cap has been in suspended animation for the twenty years he was legally gone. It probably would have been best to have just started his adventures back up without addressing what was going on while he was gone. Of course, if they had done that, someone (PROBABLY ME) would complain about it because those years were not documented. We have a saying for that here in the south: Can’t win for losing. One thing that O’Neil loved to do in his SHAZAM! stories that gets old faster than baby crying on an airplane is the cheesy joke. Scope these two pages and try not to cringe at the pun toward the end. I do love the use of the “KA-RUNCH” sound effect though. I wish real world punches made that same noise. No one in history has ever loved string more, which makes me love this old man. Too bad for him, the people who actually own the string take string theft so seriously as to utilize a Spy vs. Spy bomb in order to stop this delightful string-loving old man. There’s also a scientist in this story who believes that since they have string and vases in this other dimension, those people must be monstrous! Surprise, scientist! They look just like us! A quick comment on that house ad too: Do I really need Doll Man and the Atom in the same comic? I mean, I like both guys, but they both do the same thing. If Doll Man shrinking down doesn’t save the day, HOW WILL THE ATOM DOING THE SAME THING SAVE DAY? But I digress. Let’s move along to SHAZAM #2, which starts off with a better cover, although those kids kind of scare me. the meta cover idea always gets me. I love infinity! The kid holding the comic seems ok, but the girl and the other little boy frighten me to Kingdom Come, and if you have read that, you know that isn’t a great place to be. SHAZAM #2, on the other hand, is a great deal of fun. Denny O’Neil and CC Beck do the main story, and O’Neil does a better job here. It seems less silly for the sake of silly, and more of the embrace of silly. Of course, a talking tiger named Mr. Tawky Tawny and a worm bad guy named Mr. Mind will sort of do that for you. if you’re so happy with the circus and your life in crime is over, why did you attack Captain Marvel? Why is he just letting you go? The highlight of the story though is when Mr. Mind makes a FOOTBALL OF DOOM! Of course, our hero manages to catch Mr. Mind in a neat little tale, but the highlight of this issue, and if you ask me, the first 10 issues of SHAZAM! is this backup story by Elliott S! Maggin and the brilliant Beck! Captain Marvel meets Sunny Sparkle, the nicest kid in the world. He is so nice that people just do things for him all the time, which is good, because he is easily the creepiest child in history. In fact, he is even creepier looking than the live action kids on the cover of issue #2. You see, for Sunny Sparkles, being so great is just awful because people give him things! This is somehow a problem for him. For me, I can’t think of much better, but maybe what makes Sunny Sparkles so nice is his lack of materialistic concerns like the ones I have. Of course, this is a comic book, and if I lived in comic book world like Sunny, and I had this power, I would inexorably get involved in some sort of heist and misunderstanding that would lead the most gangster gangster of all time to come looking for me. look at Sunny on the second page looking at Captain Marvel and tell me the reason people give him things isn’t that they are scared to death of him. I dare you. I love how the boss goes from just a sort of meany behind a desk whose cigar is also angry because he is to the most gangster gangster ever merely by putting on his hat and having a gun under his coat. Despite his ability to change from a Flintstones bit villain into the crime lord of Earth-S, even he finds Sunny’s charms irresistible. This gangster gangster gets more impressive every page! Now he tilts his hat up slightly, and he is A TRUSTWORTHY ADULT. I love it! Later on we see Sunny Sparkle again, but he is with his rotten cousin. I wonder what New 52 Sunny Sparkle would be like. Never mind. I don’t. Please don’t, DC! All in all, these stories are fun. If you can find them cheaply, they are worth a read simply for the golden age backups, but the issues themselves are too pricey just for those, and I am sure you can find better reproductions of those golden age stories elsewhere. These 70’s stories, while at their best they are fun, they were just too behind the times to catch on then, I am sure. For instance, I decided it would be neat while writing this blog to listen to the top albums from 1973, the year these comics came out, and let me tell you, Dark Side of the Moon does not mesh as well with Sunny Sparkles as it does Wizard of Oz! Hope you’ve enjoyed my guest blog here! I can be heard on VOC Nation on two, count ’em, TWO podcasts that air live prior to archiving! One is called Her Dork World, His Dork World (Twitter, Facebook), and it features my girlfriend and I discussing dork culture from a male and female perspective, and it debuts on March 20 at midnight! My other podcast there should be up by now, having debuted yesterday! It’s called Compton After Dark (Twitter, Facebook), and it focuses on wrestling, comics, politics, toys, video games, and more. Listen on Tuesday nights from 11:30PM to 1AM, EST! Be on the lookout, and if you liked this, bug Paul and maybe he will let me come play in the Longbox again with some Punisher Bronze Age stuff or even more Captain Marvel! Thanks for reading, and I can’t wait to talk to all of you again! Look at those exclamation marks. Am I Stan Lee or something? Posted on March 19, 2014, in Conspectus and tagged C.C. Beck, Captain Marvel, DC Comics, Fawcett Comics, Shazam. Bookmark the permalink. 39 Comments. Exellent write-up, Dean. I bought Shazam #7 at a flea market a couple of years ago, but still haven’t gotten around to readin it. I’ve always had a soft spot for “the other” Captain Marvel though, maybe bescause of his awesome costume, or maybe because he provides an alternative to Superman. I agree with you that the cover of #1 should not have Superman. Not only because he’s not in the issue, but because I think it minimizes Cap Marvel. By the way, there is an awesome website called comicbookplus.com which has tons of Golden Age reprints (sorry, no DC, Marvel, or Archie) including, at least, Whiz Comics, as I’ve read Which #’s 2 and 3 from there. I don’t like reading comics digitally, but the price is right! Thanks for the kind words! I feel like Superman just overshadowed what should have been the big deal here, and that is the Return of Captain Marvel! I think part of my love for him is the fact that he is a great Superman alternative. His innocence and naivete is much less forced that Superman’s in my eyes, although they have apparently ,made him into a juvenile delinquent in the New 52. Oh well, I still have MY Captain Marvel. One day over on my blog about 90’s comics, I will do some Power of SHAZAM! 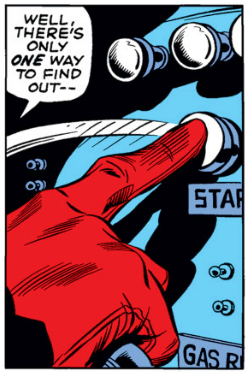 Ordway nailed the character in a way like none had been able to since the 40’s. For another 1990s take, it’s also worth running down Prime, from Malibu’s Ultraverse, which was very much inspired by the original Captain Marvel (and which a couple Ultraverse creators singled out as being the most movie-worthy of all the lost Ultraverse concepts). We are gonna cover Prime on the next episode of Compton After Dark at http://www.VOCNation.com on Tuesday! That is one of my favorite characters ever. Of course, I am an Ultraverse mark. My understanding was that DC could use the name “Captain Marvel” in the strip itself, but not on covers or in merchandising. The subtitle was changed from “the original Captain Marvel” to “the world’s mightiest mortal.” Besides the copyright/trademark glitch, DC was probably not eager to publish a comic with the name of their biggest competitor on the cover. One story, “What’s in a Name? 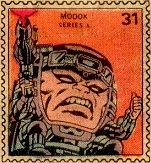 Doomsday” was apparently a spoof of the trademark problem. Cap was Fawcett’s most popular character in the Golden Age, and often appeared on the covers of first issues of new comics (e.g., Hopalong Cassidy #1) as a sort of official greeter. 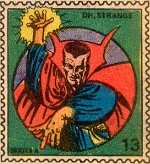 Superman may have performed the same function for DC in the 1970’s, hence his appearance on the cover of Shazam #1. Personally, I liked the tongue-in-cheek Shazam (and Plastic Man) comics, but it seems most comic book fans wanted their action heroes played straight. And the adults who liked tongue-in-cheek action-adventure in TV and movies (e.g., James Bond) did not read comics. And here is the Hopalong Cassidy cover in question! That’s the way I understand how the name Captain Marvel had to be used by DC as well. I had not thought of the fact that DC would not want Marvel on the cover, and that may have been true. Great point! I just felt that with the history between the characters and their apparent desire to keep Cap separate from Superman anyhow (although Lex Luthor does make an appearance in the first 10 issues), his presence overshadowed Superman, and paert of me thinks that was not an accident by DC. It isn’t that I don’t mind tongue-in-cheek stuff or I dislike humor. I am a hige fan oif the Maguire/Giffen.DeMatteis Justice League, Ambush Bug, Captain Carrot, and more. I just don’t think the Denny O’Neil stuff was very good, and even that sort of humor needs to be contemporary for me to succeed. I did really enjoy when Elliott S! Maggin handled the back up stories. He seemed to have a grasp on the character and that sort of story that generally eluded O’Neil, who was tremendous at crafting a different type of story. Ronan the Accuser has come to accuse you of playing tricks on him! How come the link for the post about the Big Red Cheese impersonification of Captain Marvel didn’t get rightfully activated on the LongBox Checklist page? Correct this at once or I’ll serve justice on the spot! I think Paul won’t put it on the checklist until it is off the main page! The Marvel family will soon solve the issues that Mr. Mind has vexed you with, but for now Captain Marvel has rescued your beloved Mar-Vell from The Negative Zone! All we need to do is slap nega-bands on a bad guy and we can solve two problems at once! Forgive me, Dread Accuser — it was an oversight, and will not happen again! There’s also my personal favorite. Haters gonna Hate! Mar-Vell will always be Mar-Vell while Captain Marvel will always be (NEW 52 INSERTS ITSELF)…um..SHAZAM!? Don’t lose your (Captain) marbles Dean, it won’t take Eons for you to reach cosmic awareness of the true Captain Marvel! You’re right! All it took was a DC Cosmic card to see that Billy Batson is truly the World’s Mightiest Mortal, the one and only Captain Marvel forever. You don’t even have to fight the 7 deadly sins of man to get that! Sorry but even in your wildest dream, the Big Red Doppelgänger couldn’t hope to replace the one and only Captain Marvel as Marv himself does so easily with Rick Jones thanks to the power of his Nega-Bands! Even an evil tyrant like Dr. Sivana recognizes Mar-Vell as the interloper here! Surely the cosmic awareness doesn’t preclude one from being aware of this! There’s only one way to settle this. The Doppelgänger is no match for the Protector of the Universe who fought Thanos, the mad Titan empowered by the Cosmic Cube! Mar-Vell could never possibly hold off an Eclipsed Superman the way the one true Captain Marvel did! There was more than meets the eye. Obviously, the poor Red Cheese collapsed under Thanos Time-Mind Sync-Warp… He got assaulted by fists of shattered illusions and broken promises. He, now wanders in the land of eternal delusion, helplessly living as a mockery of the One and Unique Captain Marvel of the Kree! I believe that your beloved Mar-Vell has come under the influence of Mr. Mind! That Venusian worm is always able to overwhelm those of weaker stuff, like Mar-Vell! I am sure Uncle Dudley and Hoppy the Marvel Bunny will be along to save him any moment! HA! One doesn’t recover from Thanos’ Time-Mind Sync-Warp and the Doppelgänger should have known better. The Evil One that the true and Unique Captain Marvel did defeat was called Dr Mynde, mind you! Great read! Been a fan of Captain Marvel since I first learned about him (admittedly much later than the author). Here’s to a resurgence in popularity for the Big Red Cheese! Captain Marvel got a raw deal … unfairly driven from the market by DC Comics, bought off the scrapheap of bankruptcy, his name co-opted by Marvel Comics … and now he is a stranger in a strange land, a relic of a more innocent age adrift in a cruel Age of Continuity.